It’s raining! It started again early this morning, coming down very hard at times. By the time we were ready to prepare the trailer for travel, the rain let up a bit and we didn’t get soaked. Most of the trip took us over familiar territory… since there is only one way in to Cape Breton Island, there is only one way out. The road was smooth and traffic was light so we made good time. 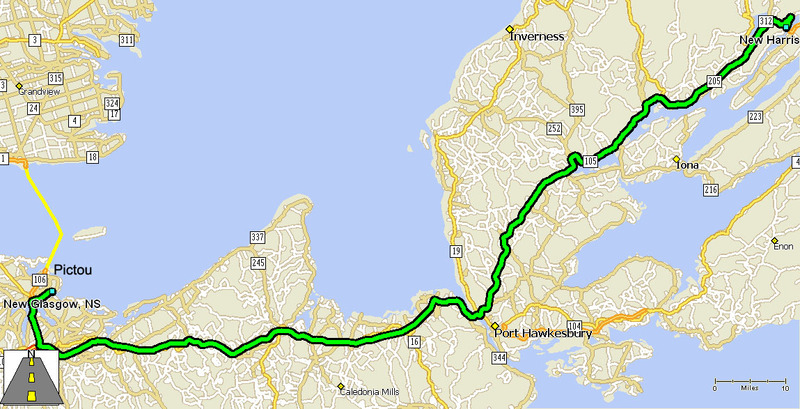 A few light showers came and went as we traveled and we arrived at Pictou, NS, by noon. When we got here it was cloudy and muggy. For a while it looked like it may clear up. About two hours after we got here, the showers came back and then it turned to a steady rain. The part of the campground where we are set up is mostly a grassy field with some gravel pads to place the trailer. The good sites by the water are apparently reserved for seasonal users. They must have had more rain in Pictou over the last few days then we had in the North Sydney area. The grass and gravel in the field are soft, which makes leveling the trailer fun (not). We wound up trying two different sites and finally settled on the first one but going into it from a different direction. You have to be careful where you walk around the trailer because the ruts caused by the trailer and truck wheels are muddy and I almost twisted my ankle. The rain has now caused the ruts and low spots to fill with water so we have a mini lake surrounding the truck. The one thing that almost makes up for the negatives in the campground is we have Internet access with a strong signal. This is the first time in over a week that we have had Internet access in the campground and we are in heaven. There is no question that we have become dependent on the Internet to stay in touch with the world. We have also taken it for granted because it is (almost) always there at home. Both of us had a ton of e-mail and I was able to update this Web site and another that I manage for an organization. So since it is raining hard and sightseeing is really not an option, we are sitting reading our mail and checking out the world through our Internet. Tomorrow is another day and weather permitting, we can explore the area.